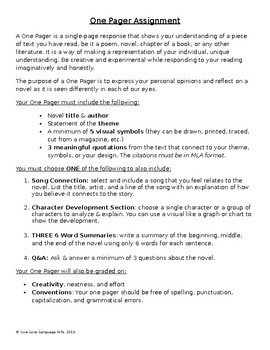 This One Pager assignment can be used with any novel. -3 meaningful quotations from the text that connect to your theme, symbols, or your design. The citations must be in MLA format. -A song: select and include a song that you feel relates to the novel. List the title, artist, and a line of the song with an explanation of how you believe it connects to the story. -Character Development Section: choose a single character or a group of characters to analyze & explain. You can use a visual like a graph or chart to show the development. 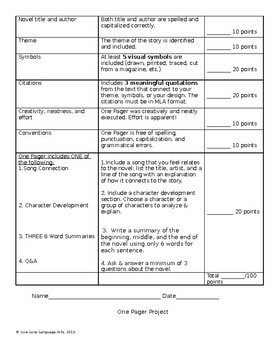 -THREE 6 Word Summaries: write a summary of the beginning, middle, and the end of the novel using only 6 words for each sentence.